I - and many others - first got into 9/11 research because of Simon Shack's groundbreaking and to-this-day undebunkable 'September Clues' videos. We all owe Simon Shack an enormous debt of gratitude for exposing the lie to millions of viewers around the globe, even if the Google and YouTube counters have to be reset every once in a while by the perps. Then take this awesome opportunity to ask Simon questions! Awesome job with the website Simon and Dr.Polloi! Thanx Martin - nice to see you here ! You state in September clues that a jamming device was used to stop regular joes taking footage on the day.. I was just wondering if, since unveiling your research, anyone has tried to refute this claim by sending you any photos or whatnot? or maybe more to the point, on the flipside, how many people have told you or stated in the "free press" (oxymorons anyone?) that their cameras were jammed? In essence i want to know more about this jamming theory, and from what sources you used to support this claim. I believe it, but just want to know more. Just point me in the right direction and i will do the rest! Thanks hoi and simon for that link on the visual control. It made me think that this kind of fakery will become easier and easier to pull off. As we are living in a digital world and film cameras are a thing of the past. Especially processing em in a dark room at ur own place. Good luck with this forum! heres hoping it stays up for a long time!!! So that the info lost off that forum has another medium to reach the public!! ... you dont really understand Judy Woods role. there is seismic data as well; which has nothing to do with video. Seismic evidence?!?! Who controls the scientists and the agencies?!?!? Like in Arlington, where the "scientists" only studied a three-minute window of opportunity, from 9:36:30am to 9:39:30?!?!?! What if the explosions---excuse me, the "airplane crash"---occurred twenty minutes before?!?!?! Sorry for flaming with my question marks and exclamation points, but I couldn't help myself! All that being said, if Simon is leading the movement down a dead-end path, like a merry Pied Piper of old, than I must say, it has been a fascinating exploration in an otherwise dead and dearthful (yes, I said dearthful) research field. 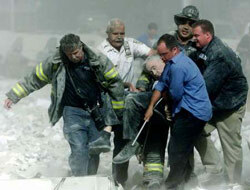 It is not our fault that no steel was saved from Building 7! It is not our fault that supposedly no photographs exist of the south side of Building 7 on fire! And as for your contention that this branch of research is meant to discredit and put off the legions of citizens who have a gut reaction that something is wrong with the official story but can't stomach this level of sur-reality, than I might hazard a guess that was the original intention. AND, that you haven't seen anything yet! "Simon Shack's amazing findings are good, but ... once you have the truth, WHERE DO YOU GO?! It's a dead end!" We are left with what is apparently their last resort: declaring the search for truth dangerous - the end "dead" - and those with the slightest curiosity about the world we live in as "followers." In my opinion, this shows the Judy Wood limited hangout is intellectually dying. Simon, you've done it! This is truly the cutting edge of the search for truth, and I increasingly suspect - not just in regards to 9/11. We are learning about how the banking cabals and "intelligence" communities operate when they really really dislike an idea - when they really really are scared of people considering something. The scare tactics, the attacks, the ridicule all from suspicious obstinate characters who are incapable of discussion ... the pattern is becoming all too familiar. I am even thankful that a visitor from Judy Wood's magical land of Oz "dingdong(thewickedwitchisdead?)" came to share another one. The people are waking up, using their brains, and the perps' old tricks of putting them back to sleep are becoming worthless. The seismic footprint of a plane striking a tower which absorbed the full shock of the plane hitting it (by not snapping in half, or whatever) would definitely not be a spike on a seismograph. The seismic evidence that we have been presented with is either b.s. or is evidence of something entirely different than plane strikes. When the "planes" hit the towers, the towers did not snap in half. Hence, we can conclude that the towers absorbed the shock of the plane-strike(s). If "planes" really hit the Towers, and the Towers really did not snap off, then the physics is simple. The Towers absorbed the shock in an incremental manner. The floors that got hit would have suffered the most force. They burned off some of this force by bending (turning force into heat). Then, they transfered the remaining force to the floors below them. Each floor bent (absorbed the force and transformed the impact energy into heat). The only point at which any seismic energy could be generated was at the basement level. By the time the force of impact arrived at the basement, it would have been a "blob" (not a "snap") due to the shock-absorbing effects of the intervening floors. (If the intervening floors could not handle the left-over energy, the building would have snapped). The Towers were giant shock-absorbers. The Towers were low-pass filters. The "plane" impact was a snap event (high frequency). The shock-absorption of the Towers would have converted the "snap" event of impact into a "bleah" drawn-out bulge, barely visible in the seismic record. That's not what the "seismic record" shows. 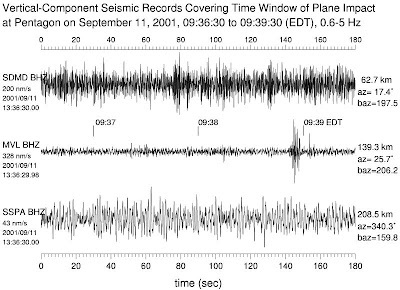 Hence, I conclude that the "seismic record" does not show "airplane" impacts. OK, just playing around with the implications for a moment...if a more 100-percent vicsim ratio is established, what would that mean in terms of expanding the playing field? TV Fakery means that tens of thousands of media personalities, politicians, as well as all the first-, second-, and third-responders to the scene---who would recognize the disparity between what was going forth as news and their physical reality on the ground---were involved. But let's take as a 'for-instance' Gary Lutnick, Howard Lutnick's little brother. "Other than a brief New York Times profile of Gary, which isn't developed much beyond toys, video games and jet skis, it's almost as if Gary Lutnick didn't really exist---as though he were a phantom." So I want props for prescience if nothing else. Let's examine whether or not Cantor Fitzgerald's Chairman, Howard Lutnick, and his sister Allison, could have fabricated the existence of a younger brother out of thin air and whole cloth. A.) It's possible. Their parents were said to have died young, while Gary was still school-aged. There is rather odd narrative detail about how this fact led the Lutnick siblings to be somehow estranged from their larger family of (presumably) aunts, uncles and cousins. Maybe this was a ploy to keep media away from them, but what keeps them away from the media? Than, there would be the larger circle, let's say of synagogue members---did they attend services on Lon-Giland? How many people would know---as little Howie made his way up in his meteoric rise---that he only had one sibling, not two? On a different level, any surviving Cantor Fitzgerald employee would know---if only in their smallish sphere of experience---that the list contains NOBODY they knew, and EVERYBODY they didn't know? Yes? This is still rather possible. Since the scheme had been in the works as a serious plan for five or ten years before 9-11-2001, than all the hires and fires could have anticipated the date with destiny. Cantor was said to occupy three floors of WTC 1, but who's to say Floor 105 wasn't in fact completely empty? But factor into this the fact that hundreds of obsolescent telephone bond-brokering victims supposedly died. Is somebody trying to use reverse psychology on me? What I don't like about the vicsim theory is that it isn't evil enough. Whenever I have been in doubt about some aspect of 9/11 analysis, I would ratchet down into the evil quotient and come up with a clearer direction of truth. It's always worked for me before. I want spouses to sell out their unsuspecting mates. I want double-crossing employers getting rid of their supernumerary staffs. I WANT DEATHS!! Some letters have been found which were on board of one of the airplanes which impacted the Twin Towers. 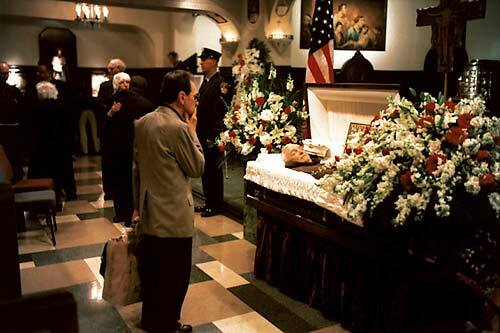 ROMA : "A letter (postal envelope) carried by one of the airplanes that crashed into the Twin Towers was found by an eyewitness of the event, a technician who was working in a nearby building and saw the event but escaped unharmed. He later returned to the roof of that building and found the letter, slightly charred in one corner but still legible. Only two such letters were known until this day - this is the third. The letter was written by a native of Chelmsford, Massachusetts, and was addressed to his uncles in California." Simon, Simon, Simon...so much to learn. That letter was speeding along at 540 mph. Ya know? I read over at the JREF that even a tomato traveling at that speed could have penetrated those towers. This is just science. A plane has considerable surface area encountering the tower's resistance upon impact. Since it's mostly empty space inside it should just about be able to pass through the tower's side. And then it would be halted and explode inside. And we know this is the case because we have the video evidence. Meanwhile, a tomato, because it's filled with pulp (which I'm sure you would concede is more substantial than air), will maintain velocity, exit through the other side and likely come to rest somewhere in, say, South Dakota or Wyoming. It's impossible to determine exactly so don't quote me. Just ballpark. 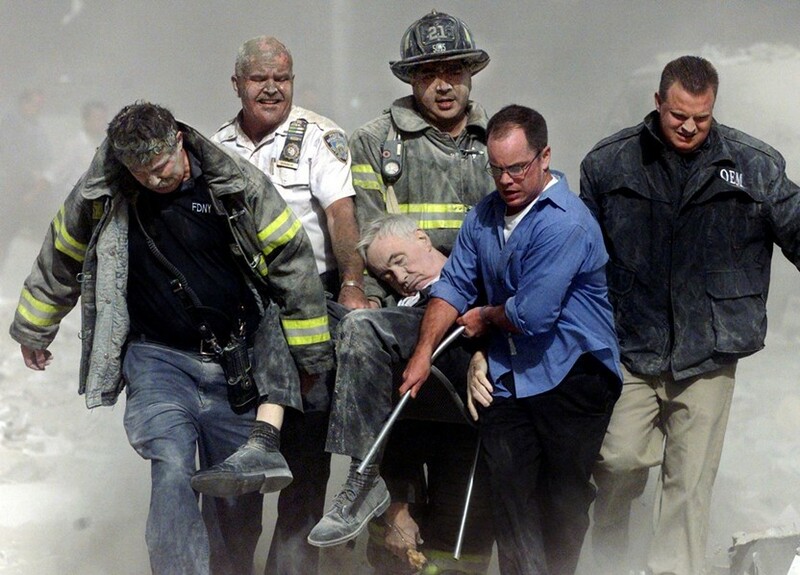 Victim number 00001, Father Mychal Judge (pronounced Judd, by the legions of people who "claim" to have known him in NYC gay AA circles, WAS A CORPSE WE SAW! The only one mind you. There is substantial evidence the famous 'photo' of the 'dead M.Judge' being carried on a chair by 4 men is a photo-shop fake. Besides, who carries a dead body on a chair? Ludicrous and absurd on its face. Further besides, Hoi informed us on Killtown's forum that Judge's death has been variously reported in the news as having occurred inside, and outside, from a heart attack, and also from falling debris, and in a basement, and also on the front steps of a church. I don't know whether Judge is/was a real, live human being, but I do know we haven't been shown any believable photo of his corpse. These financial organizations are worldwide, with so many employees, that it is easy to imagine the business 'transferred' dozens of 'future victims' working at another location in some anonymous back-office function (accounting?) 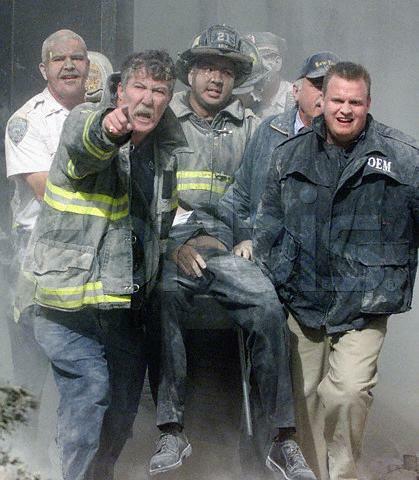 to an unused floor in the WTC - that just happened to be one of the floors hit by a 'plane'. It seems entirely reasonable that real employees of these financial firms would never have met their 'dead fellow employees'. Steven, please do not attack me personally for this. I'm not picking on you specifically. I generally find what you post thoughtful and reasonable. These two points, however, seem to be muddying the water, and deserve further analysis by all of us. fbenario, why would I attack you personally? Do I really come across as that much of a snot? If so. I'm sorry. All of us can not be up to speed on everything at once. I have been a legitimate, trusting member of a message-board community for all of about one week, so I have a lot to unlearn as well. and as far as I know there is no evidence that the several images of the portage of Father have been photoshopped. In fact, there is a great deal of narrative information which would suggest just the opposite. This first image is a misfire. Christian Waugh, the fireman yelling and pointing at Stapleton, tells us of this narrative nugget: that he was angry at the photographer for just doing his job, so was yelling at him to stop taking pictures. However, the image is a dud because of the unfortunate fact that Father Judge's head has slipped out of view and a false impression makes it appear as if Fireman Zachary Vause's head is atop Judge's body. So it is this second image which was widely distributed. The PTB should have dispensed with the written story line about Waugh being mad at Stapleton since the image was botched, but they stupidly released it anyway, and we can spot the overwritten detail. You ask why was Judge carried on top of a chair? Oh my dear fbenario, you aren't up to speed are you?! You must absorb the work of Ray Ubenger, who has dissected the snuff film 9/11 The Nadet Brothers to see the immense evil of the symbolism here. This was Jesus's crown of thorns, INRA moment! Carrying the King of the Christians (Queer, my dear,) around on his throne! Hail Christian! Hail Jew!